1. 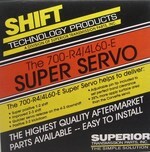 Voted as One of Transmission Digest's "10" Best Products for 1997. 2. Largest apply area available for 700-R4. 35 percent more apply area than the Corvette servo. 3. Super positive 1-2 shift. 4. Quicker servo release on the 4-3 downshift. 5. Positive 3-2 kick down. 6. 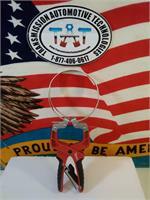 Adjustable pin tip included to set perfect band clearance. 7. Great for heavy service, towing, racing and off-road. 8. Also can be installed on the 4L60-E. 9. Kit contains two-piece 6061-T6 billet aluminum piston set with three piece steel washer set, servo clip, servo pin extender, custom return spring and four piece Teflon sealing ring and O-ring set.